I just got this great laundry soap from The Ecology Works. This is great anti-allergen laundry soap. I have kiddos with a lot of different allergies in my home so I am always trying to find products that will not set off their allergies. 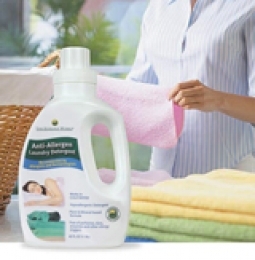 Laundry soap is very hard to find with no allergens. I am super happy with The Ecology Works. It has no allergens in it and my kids can wear clothes washed in this laundry soap all day with no problems. It smells great too even though it doesn’t have perfumes and dyes. I still love the smell. It comes in a great bottle for dispensing and is really easy to use. One bottle lasts a long time and goes a long way as well. Very eco friendly laundry soap! Neutralize Protein Allergens on Contact! You can find The Ecology Works on their Website!